In an era with online banking and new technologies every day to help us stay organized it is still easy to lose track of which bills you have paid. Especially for those who do it the ‘old fashioned’ way and mail in paper checks every month to pay your bills it can be difficult to remember who you have paid already. 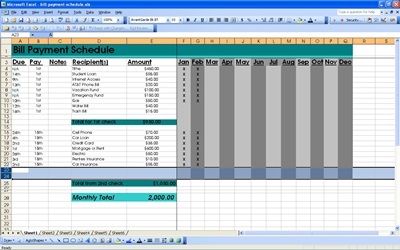 Microsoft Excel has a great program for tracking which bills you have paid. The bill payment schedule tracker not only allows you to remember which bills you have paid, but also allows you to budget accordingly by seeing all your bills listed in one place. The best feature of the bill payment schedule template is to track which bills you have paid. These days banks have no mercy when there are late payments or overdrafts. You can be hit with late fees, overdraft fees or even worse, higher interest rates! For most, missing bills is not due to the inability to pay, but due to losing track of bills because we are all so busy! This software will help eliminate that problem. Most of us don’t even realize how much money we spend on a monthly basis. Sometimes lining up all of our bills and seeing the monthly total can be a big scary. This bill tracker will allow you to see which bills are important and which ones you can do without. Sometimes you just need to see how much money you are really spending in order to make the necessary cutbacks. The bill payment schedule is a great tool for getting finances in order. It is a free tool used through Microsoft Excel. Download today to get your finances in order and to make sure you are not wasting any more money on late fees and overdraft charges!